Police were in short supply in NSW in the 1830s and convicts holding a Ticket of Leave were often appointed as constables. Five Tocal convicts served in this way. One of them was Richard Hughes, appointed constable at Paterson in 1832 and dismissed in favour of a free immigrant on the instructions of the Governor shortly afterwards. 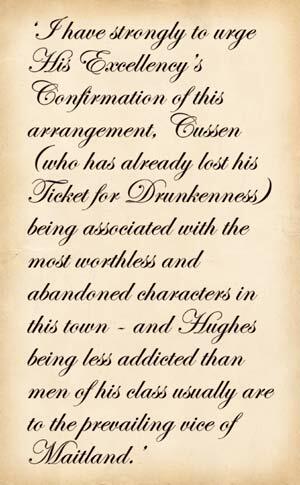 One month later the free constable was himself dismissed for drunkeness and neglect of duty, and Hughes got his job back. The inns and grog shops of Maitland provided much temptation for Ticket of Leave holders, including those appointed as constables. In 1834 the Police Magistrate at Maitland ordered a temporary exchange of duties between constables Richard Hughes of Paterson and Robert Cussen of Maitland. A transcript of part of the magistrate's letter to the Governor is shown at right. The vice of Maitland was the downfall of another police constable named John Waggoner who was one of the first convicts to set foot on Tocal in 1822. In 1833 he was dismissed for corruption and drinking in an unlicensed Maitland 'house'. He later committed murder, was imprisoned as criminally insane and died in a Sydney lunatic asylum.